About Stephen Tippet Andrews: Stephen Tippet Andrews enlisted in the 85th New York Infantry Regiment on 26 August 1861. He helped organize Company F, and was mustered in as first sergeant of the company in the second half of 1861. Andrews was captured with the “Plymouth Pilgrims” in Plymouth, N.C., on 20 April 1864, and was held captive in Georgia and South Carolina for almost a year. Item description: When Andrews joined the Union army, he left behind his sweetheart Margaret “Maggie” Little, and faithfully wrote to her during his four years of service, frequently from posts where he was stationed in North Carolina. After he was honorably discharged on 8 April 1865, Stephen and Maggie were married in October 1865. The Andrews first settled in in Corry, Pa., where Stephen worked as a grocer, and later moved in Franklinville, N.Y., where he was appointed Postmaster, a post that his wife Maggie took up after Stephen’s death in 1891. 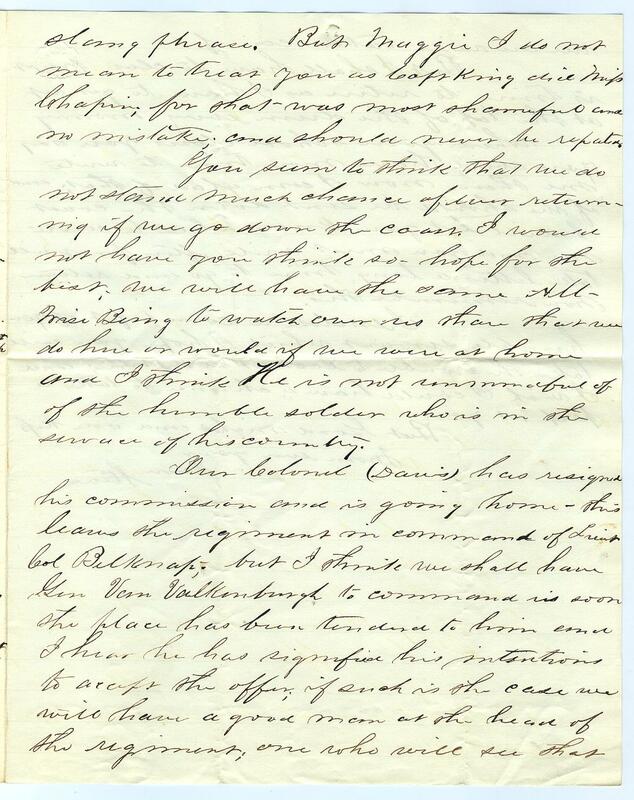 In this letter, Stephen writes to Maggie assuring her of his faithfulness, and tells her of his new commanding officer. 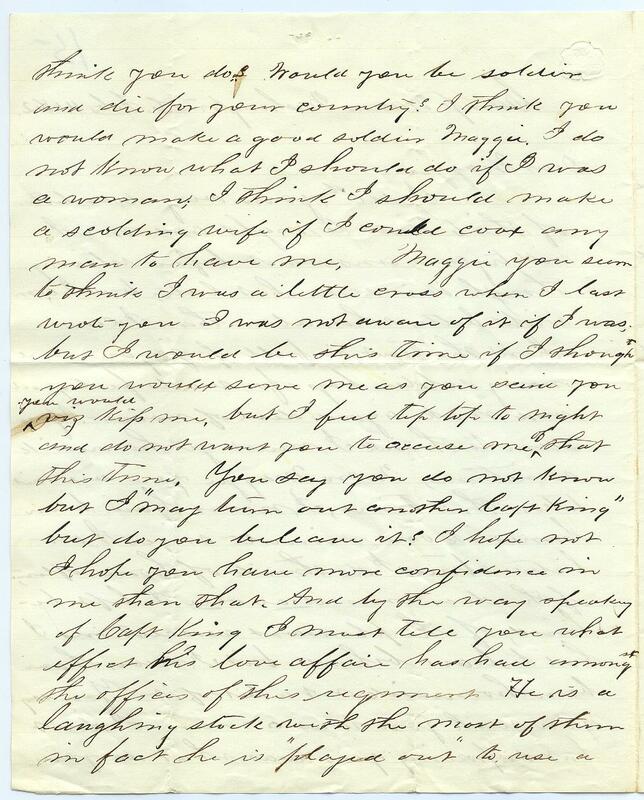 We will be featuring letters from Stephen to Maggie throughout the rest of the Civil War Day by Day project, and look forward to your comments as we follow their story! Item citation: From the Stephen Tippet Andrews Letters #5324, Southern Historical Collection, The Wilson Library, University of North Carolina at Chapel Hill. Camp Warren Washington D.C. Feb. 11, 1862. I rec’d your very dear letter of the 6th inst* to night and now I will try and answer it before retiring though it is somewhat late; but I can write better when alone than I can when the tent is full of joyous and noisy soldier boys – for we do feel good and make a good deal of noise – You seem to think I must get homesick sometimes; No no Maggie you are mistaken this time; I never have been homesick one minute since I enlisted – true I do think of home often; of the dear ones – dear one I left behind; of the pleasant associations I had to leave behind – but I never have been homesick – not a bit of it – You say you wish you was a man – I don’t but suposing you was what do you think you do? Would you be soldier and die for your country? I think you would make a good soldier Maggie. I do not know what I should do if I was a woman; I think I should make a scolding wife if I could coax any man to have me, Maggie you seem to think I was a little cross when I last wrote you I was not aware of it if I was; but I would be this time if I thought you would serve me as you said you would viz kiss me, but I feel tip top to night and do not want you to accuse me of that this time. You say you do not know but I “may turn out another Capt King” but do you beleave it? I hope not. I hope you have more confidence in me than that. And by the way speaking of Capt King I must tell you what effect his love affair has had amongst the officers of this regiment He is a laughing stock with the most of them in fact he is “played out” to use a slang phrase. But Maggie I do not mean to treat you as Capt King did Miss Chapin; for that was most shameful and no mistake; and should never be [repeated?]. You seem to think that we do not stand much chance of ever returning if we go down the coast. I would not have you think so – hope for the best; we will have the same All-Wise Being to watch over us thare that we do here or would if we were at home and I think He is not unmindful of the humble soldier who is in the service of his country. Our Colonel (Davis) has resigned his commission and is going home – this leaves the regiment in command of Lieut Col Belknap; but I think we shall have Gen Van Valkenburgh to command us soon the place has been tendered to him and I hear he has signified his intentions to accept the offer; if such is the case we will have a good man at the head of the regiment; one who will see that we are will taken care of. 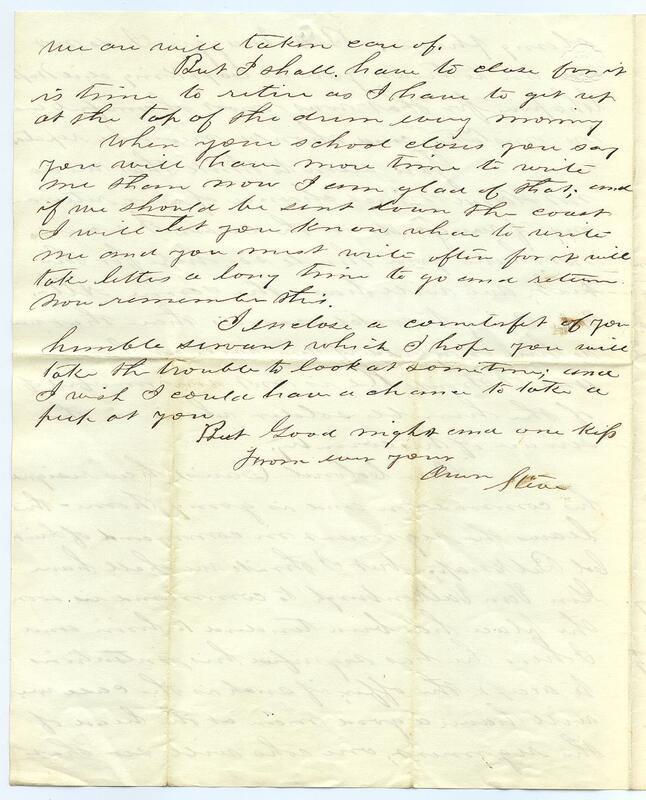 When your school closes you say you will have more time to write me than now I am glad of that; and if we should be sent down the coast I will let you know where to write me and you must write often for it will take letters a long time to go and return. Now remember this. *Note: At the time of the Civil War, the use of “inst” (instant) next to a date indicated the current month. The abbreviation “ult” (ultimo), which Andrews also uses in later letters, refers to the previous month. 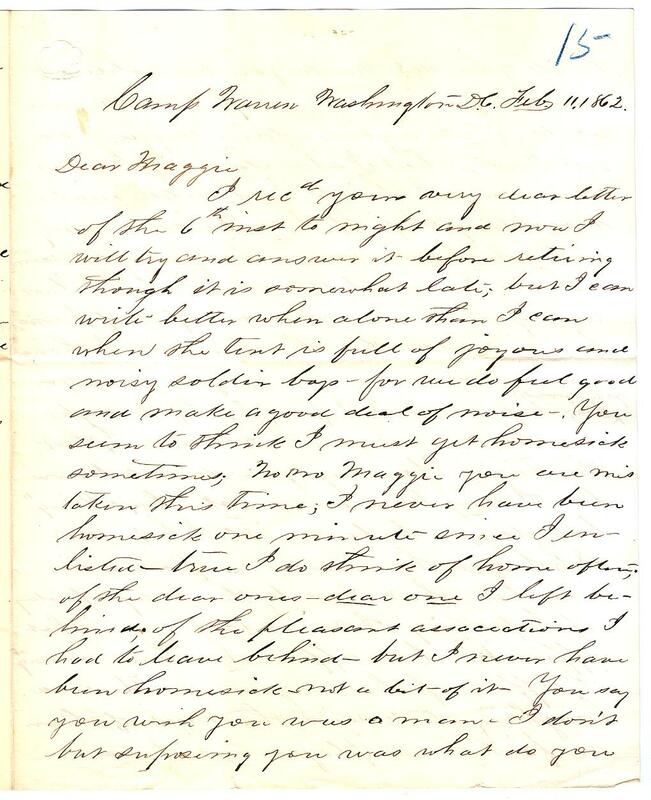 This entry was posted in Southern Historical Collection and tagged 85th New York Infantry Regiment, family, love letters, Margaret Little Andrews, New York, North Carolina, Plymouth (N.C.), Plymouth Pilgrims, Stephen Tippet Andrews, United States Army, Washington (D.C.). Bookmark the permalink.